Read about this year’s performers on the 2019 Performer Profiles page. Nihon Buyo, or classical Japanese dance, is a theatrical drama with music and dance derived from the Kabuki tradition. Similar types of Kabuki music are seen in Nihon Buyo performances. Music types include Nagauta, Kiyonomoto, and Gidayu. Singers are accompanied by musicians who play shamisen, tsuzumi, and fue. 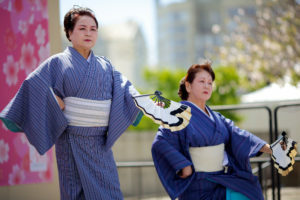 Minyo (Japanese Folk Dance and Song) has been handed down from generation to generation. These dances evolved from ancient traditions of dancing and singing to pray for good harvests and honor ancestors. Nearly every district of Japan has a rich heritage of songs that reveal the characteristics of the local people and their history. There are rice planting and fishing songs, as well as songs of carpenters, miners, sailors and craftsmen. Some lyrics praise scenic beauty, and others tell stories of historical figures and festivals.